The Postman has been very kind to me lately. Well, actually, some lovely people from the internet have – the Postman actually is a bit of a plum (While You Were Out Card when you didn’t even knock and I was in view of the door? Not so much Postie!). The first package I received a few weeks back after winning Em at OhGoshEm’s handmade Christmas giveaway. She had made sets of gifts for friends and family for Christmas and had one left over which she very kindly gave away on her blog. I was over the moon to win as I’d been following her Christmas DIY’s with significant envy (mine were just not as good!) so to have my very own set was very exciting! The hot chocolate is blocks of chocolate you melt into a mug of hot milk (I had one today and it was just to die for) and there’s even a tiny test tube of Baileys to go in it! 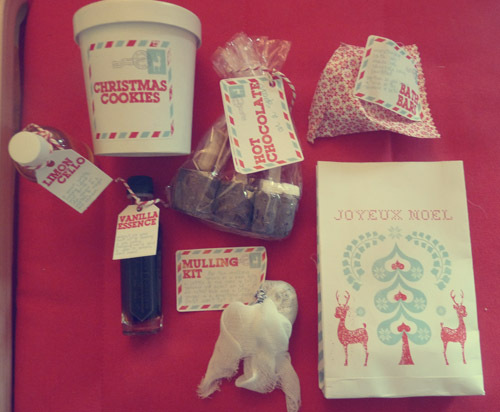 The Christmas cookies are a set you can make yourself and I cannot wait to use the mulling kit, bath bars, vanilla essence and limoncello. I highly recommend you check out Em’s blog, it always puts a smile on my face! 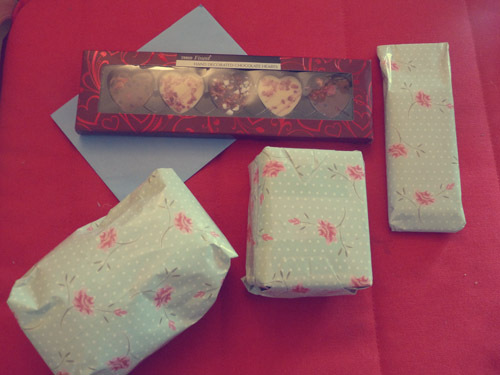 A few weeks ago I signed up for the Random Act of Kindness swap on Char’s blog. I was chuffed to be matched with Laura as I love her blog, and even more chuffed when this package of wrapped presents arrived for me! 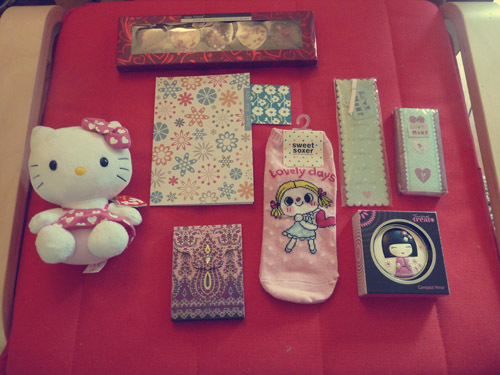 It felt like Christmas when I tore off the wrapping, and look at all the lovely things she bought me; aren’t I lucky? Thankyou Laura! I feel so lucky to have met such amazing ladies through blogging; people I now count as friends who are so kind and thoughtful to me, and I cannot thank them enough. 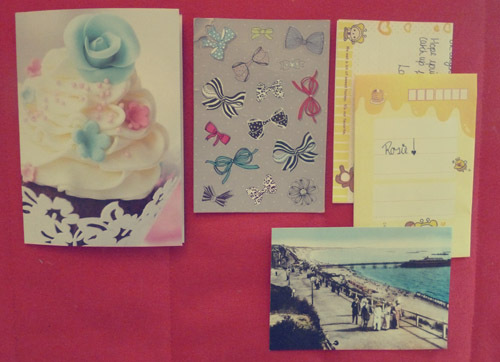 Last week Chloe and Gem both sent me cards to cheer me up and this week Laura sent me a vintage postcard of Bournemouth and a letter on awesome Rilakkuma paper! It made me smile so much having cards on my doormat when I got home from work, I really am a lucky lady to have people who are so lovely to me.